The importance of public speaking can't be overstated! You may not be running for a public office or planning to accept an Oscar... but here's a fact. Feeling confident in front of a crowd can improve ALL areas of your life, professionally AND personally! Sooner or later, you will be asked to speak in front of an audience. When that time comes, would you rather be caught flatfooted (or tongue-tied as the case may be)... or will you grab the opportunity and TRIUMPH? You may be asked to deliver a toast for the bride and groom during a wedding. You may be asked to deliver an inspirational speech at work if you happen to receive an achievement of some kind. You may be asked to deliver a lecture about something you profess to know better than anyone else. You may be asked to say some words about the birthday celebrant during the celebration. You may be asked to address people who have come to congratulate you after a triumph you may have accomplished. You may be called upon to publicly welcome a new member of an organization to which you belong. Of course, these are just a few examples. There are plenty more. And you could be called upon to deliver any of them with very little notice... and no opportunity to back out! Will you be ready to take on the challenge when it comes? Or will you falter before you even begin? Given the importance of public speaking, it's good to know that it's a skill we can all acquire once we put our minds to it. Anyone can learn to speak - and speak well - and it's something we can teach ourselves from the comfort of our own homes. (That being said, I do recommend forcing yourself to speak up in public at every opportunity in order to overcome any anxiety). Preparation ensures perfection. Prepare your speech beforehand. This will guarantee that you'll have all the bases covered and you will never have those uncomfortable moments of silence when delivering your speech. Practice makes perfect. 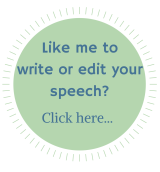 Don't settle for just one reading of your prepared speech prior to actual delivery. Read it over and over again until you get things right. Intonation is the key to a dramatic delivery. Practice various tones for your voice when delivering certain points of your speech. This will guarantee that your delivery won't be monotonous and boring. Family members matter. Practicing in front of the mirror can only serve you until a certain point. Eventually, you'll want to develop your public speaking skills in front of a live audience. The best audience that can give you an honest appraisal of your performance? Your family members (excluding your mother) of course! Make it memorable. Sprinkle shocking statistics, witty quotes and memorable humor into your speech, to give your audience an experience they will never forget! Learning to speak well in public will hold you in good stead at work and in countless social situations. The confidence it gives you helps open doors and enables you to achieve your goals. It is a skill that every person, regardless of age, gender, creed, religion or profession should strive to learn.